Which institutions may be hardest hit by the proposed NIH funding cap? At the recent NIH Council of Councils (viewable in this webcast), Michael Lauer presented the proposed cap on the NIH grants using the Grant Support Index (GSI) (see our previous post on the cap) and the presentation was followed by an active discussion. The talk begins at 1 hour 23, and the subsequent discussion at 1 hour 57 minutes. The discussion highlights that the cap is constantly being revised, and currently now may affect only 3% of researchers, rather than the 6% suggested earlier. As Lauer points out, 65-70% of NIH-funded investigators are on one R01 or less. Epstein points out that other things may affect this distribution of funds, such as where in the country investigators are located. So, which institutions are likely to be affected by the cap? Chris Pickett, from Rescuing Biomedical Research, has kindly passed along data gathered from NIH RePORTer. He downloaded all active projects data, sorted by activity code (R01, R21, etc) and inserted point totals for each grant based on Table 1 from the preprint, “Marginal Returns and Levels of Research Grant Support among Scientists Supported by the National Institutes of Health“, by Michael Lauer et al. to associate the number of GSI points each NIH funded PI has. There were 30,624 PIs in the total dataset. 19349, or 63%, have 7 points (an R01-equivalent) or fewer. 1797, or 5.9% of investigators, were above the 21-point cap. These numbers are both close to those provided by NIH, so this data appears to be a reasonable approximation. 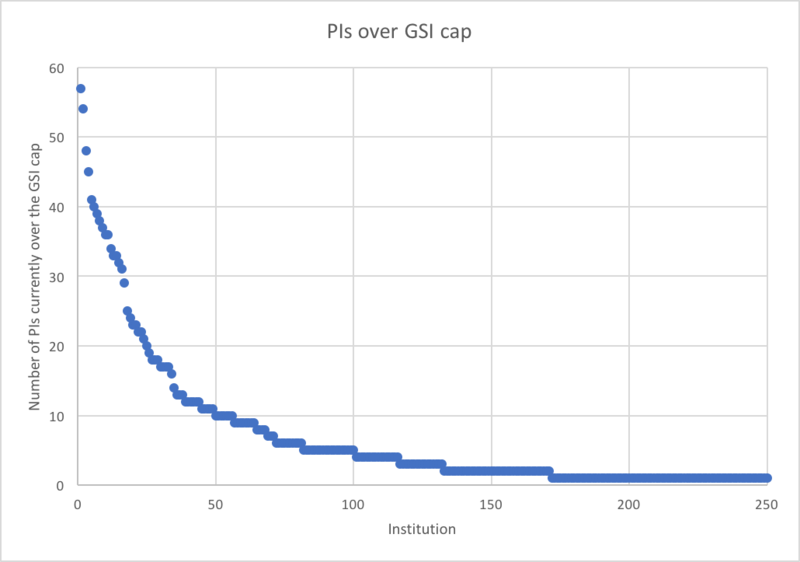 How many PIs per institution are over the cap? 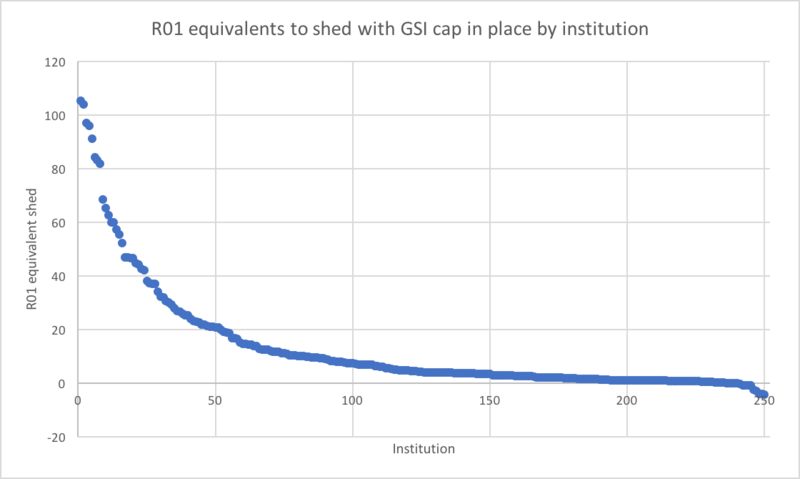 How many R01 equivalents would need to be forfeited to get all of their PIs under the GSI cap? Aside: Why are some of the points negative? This analysis may have been complicated by PIs who have multiple appointments. The data were originally processed asking for the GSI points of each PI, who are all on 22+ points. The institutions to which the grants were awarded were then interrogated and the number of points totaled. If points are split across institutions, this may then complicate the analysis. Some institutions will be in exceedingly bad shape after this cap, and it is perhaps not surprising that some of these are also the wealthiest institutions. One can take the number of R01 equivalents being lost and divide by 3 to roughly give the number of extra PIs to maintain that number of grants, which is 35 as the most extreme case for Massachusetts General Hospital. Most PIs don’t have more than one R01 equivalent, let alone 3. Therefore a small percentage of PIs are affected, and are further very highly concentrated in particular institutions. The voice given to this small group should be responded to with this borne in mind, as the responsibility of NIH is to the entire biomedical enterprise. As Epstein himself points out, “Basing NIH policy on correlation is something scientists don’t like to do”, and the same should apply to over-emphasis on extreme data points such as the institutions who have become most reliant on NIH funding. After all, the University of Pennsylvania has the third-highest number of affect PIs, and the 2nd highest loss of R01 equivalents based on the cap, and the bias here must be recognized as part of a scientific discourse on this issue. If these investigators are as excellent as those such as Epstein claim, then they are likely the ones most able to diversify their funding portfolios and seek funding elsewhere, and thus reducing the strain on the system, rather than instead losing promising early and mid-career researchers. It should be remembered that the system is still constantly expanding with more and more early career researchers, still largely being pushed towards the academic career track, and it is the responsibility of the scientific enterprise to ensure sustainability. Stay tuned on the Rescuing Biomedical Research blog for an upcoming post by Chris Pickett on the institutional distribution of K99s and R00s. Thanks for doing this analysis! I’m curious what mechanism(s) the R01 equivalents are. Is it multiple R01s that drives most of these PIs above three equivalents? Does this change by institution (R01 vs other mechanisms)? Good question – let us get back to you on that one! I haven’t had a chance to break it down by mechanism, but I can break it down by points. 881 PIs (49%) are over the cap solely because of 7 point grants (including R01, P01, U01, U19). 1,590 PIs (88%) that are over the cap get at least half of their points from 7 point grants. I think it’s safe to say that 7 point grants, likely R01s, are the primary driver. Hi, What is the source of the school data which you use for each University? Hi, This is from the NIH RePORTER.